Composite carbon fiber is the future. Carbon fiber props are lightweight, flexible, cost effective and extremely efficient. 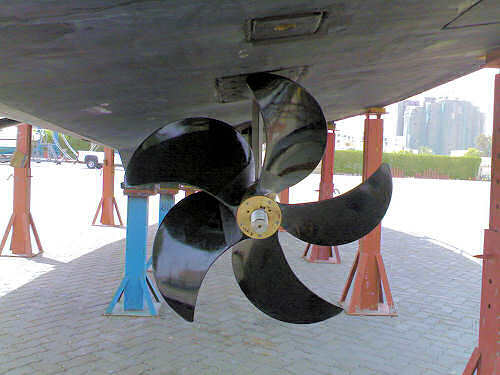 Because of this, carbon fiber propellers have been installed on ships and luxury yachts achieving remarkable success. Today more products are being made from composite carbon fiber because of it’s superior performance and durability. Marine technology has also turned to carbon fiber for developing propellers, yacht masts, hulls and many other products for vessels. Give your yacht a “Competitive Edge” with carbon fiber props. With fantastic features such as; replaceable blades, increased speed and fuel efficiency, you will get top dollar when it’s time to sell. Plus the extra advantage of always having spare blades on board. Spare blades easily stack and store. They weigh around 7 lbs. each (1 meter blade). Place your mouse in the text box below to pause scrolling. I am the owner of MY “Spirit” and also the founder of New Zealand Yachts. We are very pleased with the propellers on “Spirit” and will be using them on the New Zealand Yacht 33m Wavepiercer currently under construction in opur Whangarei, New Zealand yard. When we replaced the bronze propellers on MY “Spirit” with the Carbon Fiber we had substantial performance lift with increased speed and reduced vibration. I will copy to you the magazine article that spoke of benefits so you can use it in your advertising. New Zealand Yachts have a booth and will be showing at the Cannes and Monaco Yacht shows in September again this year and will also show at Fort Lauderdale in October. It would be our pleasure to acknowledge your company and your Carbon Fiber Propellers on our stand at all these shows if you could provide us a sample propeller and perhaps some technical information that we could use to communicate the benefits of your product over competitive options and our continuing to using these props on the future yachts. The Oceanfast Company built the Perfect Persuasion as the Perfect Prescription in Western Australia 5 years ago. She is a GRP construction and she is 150 ft. in length with two V-12 Paxman diesels, top speed over 25 kts. I’m told that the 9-meter shafts (140mm dia.) with only one “P” bracket for support caused an enormous amount of vibration with the original LIPS metal props. So much vibration, that they could not successfully operate the vessel. The decision was made to try AIR props and they have been aboard ever since. During the last 3 years of operation we have put countless miles on these props and they have served us well. In May of this year we did a speed trial and we recorded 0,2 of a knot slower speed than the top speed when the vessel was new, using our AIR props! We have changed out individual blades, as you know when we have needed them, but as with many new technologies, the price of reconditioned blades or replacement blades continues to drop. Given the fact that the vessel could not operate without AIR props due to the design and resulting vibration factors the cost of reconditioning or replacing blades (2 or 3 blades in total each year depending on items struck & wear etc.) is minimal. All vessels are different and each application of propulsion has it’s own special requirements; we with the restraints here are extremely satisfied with the performance and continued support of our AIR propellers. I might also add that the replacing of a blade (s) underwater is a straightforward ordeal, which I have participated in. We have not been inconvenienced by this procedure and have not had to alter our cruising schedule. We finally launched and had an opportunity to try your carbon fiber propellers. They did everything you said they would. The performance of the boat was fantastic. She “got up onto a plane” quickly and at only 1400 RPM ?? She accelerated like a race car. In fact rapid application of throttle from 1400 to 1800 rpm if you are not “holding on” can give you quite a surprise. Of course no vibration and very quiet. It seems that with 1/2 fuel & 1/2 water with 28 people onboard (a small party) we achieved at 1800 rpm approx 22 knots and at 2000 rpm we saw 26knt. The next day with less load (5 people) we saw 28knt at 2173 rpm. I expect that she will do just over 30 knots when we get her up to 2350 rpm. The props have created quite a “buzz” with the “fast boat” people here and I am sure that you will have inquiries. In the past year, we purchased a set of carbon fiber props. In operating the boat, I’ve noticed less vibration and noise. Also, while running at the same RPM, we’re gaining 2-1/2 knots and using the same amount of fuel. Therefore, we are getting farther and spending less money on fuel expenses. I like being able to change individual blades and the light weight of the Contur® props versus bronze props. I’m very pleased with the performance and cost savings in fuel and yard bills with the carbon fiber as compared to reconditioning bronze props. Dear Mr. Nicholas and Dr. Mel. Hope you are all fine and in good health. Just got home after working all day at the boat yard installing your fine Carbon Fiber props. I had a problem, the Key way width on the Carbon Fiber Props was wider than my shaft key way width. But I fixed that by making a new key to match your Carbon Fiber Props. The difference was nearly 1/2 a mili. I thought I was able to use my old used key on my shaft with your Carbon Fiber Props, but that problem now is solved. I sailed her back to the Marina from the boat repair yard and what shall I say? Yes, I will say I will never use Nipral props again! She was light smooth, no noise and fast in reaction. I did not yet do a full test, but will do that in the coming days to see the real difference. I already felt the difference just in this short distance. Like a father, she was smooth even steering her was different. Steering her was light, smooth and engine load was much less. I have only one problem now. What shall I do with my old Nipral metal props? Just joking! Once you sail her with Carbon Fiber Props, you will totally dislike using Nipral Metal props again. No matter what! I will write you again in another e-mail about the differences because I have old records using the Nipral props and will compare. I attached images of the Carbon Fiber Props on the Luhrs 44 so you can have a look too. My friends; all you said was true and I am more than happy. I thank you and all your team for your fine perfect work and service in the past months. After testing and comparing the old data with the new results the boat gained 1.8 knots more speed and between 10 to 15% less engine load. That makes the engines temperature in Kuwait heat less. So the result is great and everything you said became true! Thanks again and best wishes to you and your team. More Speed (10%+) • The flexibility of the blades allows the yacht to achieve her top speeds at lower RPM rather than full throttle. Fuel Savings (10%) • The propeller has the optimum pitch across a wide operating range resulting in increased fuel savings. Noise Reduction & No Prop Vibration • The carbon fiber propeller design allows each blade to be identical in size, weight and shape which dramatically reduces vibration and noise caused by metal props. Greater Strength • Carbon fiber composites are ten times STRONGER THAN STEEL, yet are still five times lighter. Changeable Blades • The Contur® propeller consists of a metallic hub and carbon fiber blades. If a blade is damaged it is easily replaced either at dockside or by a diver. Reduced Shaft Weight • Carbon fiber propellers are extraordinary light weight, approximately 1/3 of a standard metal. This reduces the stress on the stuffing boxes and propeller bracket bearings. Impact Resistant • A combination of high strength material at the edge of the blades guarantees a very high resistance to impact thereby reducing blade damage as a result of grounding or contact with submerged objects. Low Maintenance • The propeller leaves the factory with the carbon fiber reinforced blades covered with a hard polished surface so there is no further need to apply an antifouling or protective paint. Increased Range • Less fuel consumption means an increase in range of approximately 15%. The Contur® propeller provides faster acceleration along with a significant reduction in fuel consumption. 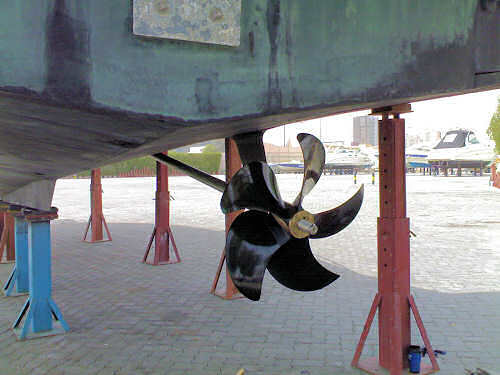 Cost Effective • Contur® propellers cost approximately 25% more than the best metal. They pay for themselves in fuel savings, maintenance savings and immeasurable increased comfort. The additional cost is more than made up for by increased efficiency. Certified ISO 9001 • Designing such advanced propellers is not enough but obtaining certification is the ultimate in product recognition. Find out more about Contur® carbon fiber props and get a “FREE” no obligation quotation for your vessel.